Despite my social media handles being @pizzagirlfriend, I'm actually more of a hot dog fan than a pizza fan these days. 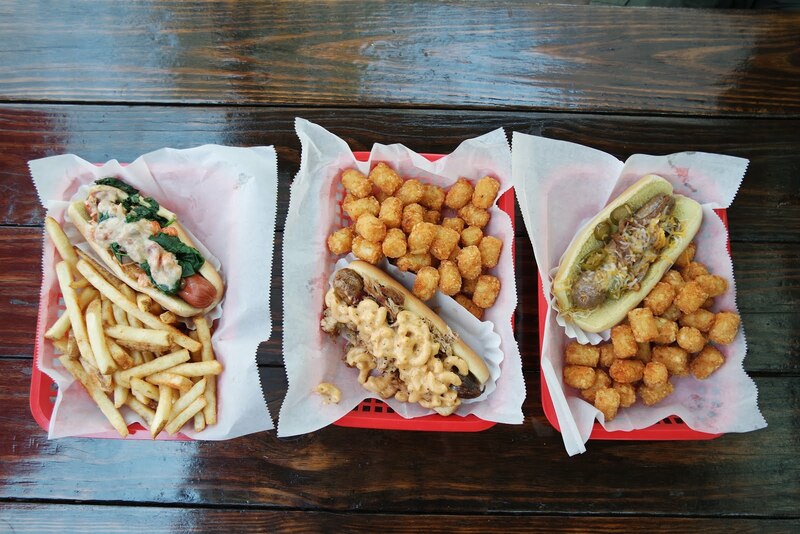 Hot dogs are a recent obsession of mine, and I think it's here to stay. Hot dogs came into my life early. Growing up middle class with two working parents, boiled Oscar Meyer wieners on Bunny buns with mac 'n cheese were an uninspiring go-to weeknight meal (no offense, mom and dad, you tried). As a teenager, hot-off-the-printer driver's license in hand, I often journeyed to New Orleans for the day to shop, meet up with friends, and, ah, who am I kidding? New Orleans was where I went to "party," as much as a 17 year old Catholic school kid knows how. And when hunger struck, I discovered Dat Dog. I remember it requiring much convincing to get me to order anything off the menu. I kept having flashbacks to Wednesday night dinners with mom and dad, and I couldn't imagine Dat Dog would be much better. But boy, I was wrong. Years later, any time I'm in New Orleans, it's inevitable I'll get Dat Dog. I even got my picky-eater girlfriend on the gourmet hot dog band wagon. Despite all the amazing new restaurants and classic New Orleans eateries, when in Nola, you'll find me at Dat Dog. But the nearest Dat Dog to me is an hour away, and what's a girl to do when the hot dog craving strikes in Baton Rouge? Sonic's chili dogs and Costco's all-beef dogs just don't cut it. That's why I'm on the hunt for the best hot dogs in Baton Rouge. Jay tipped me off to Frankie's Dawg House, which recently came under new ownership. Tucked away on Perkins behind Magpie Cafe, this unassuming hot dog joint is easy to pass up if you're not looking for it. Recently Chuck P, our intern Hannah and I decided to see what all the fuss was about. 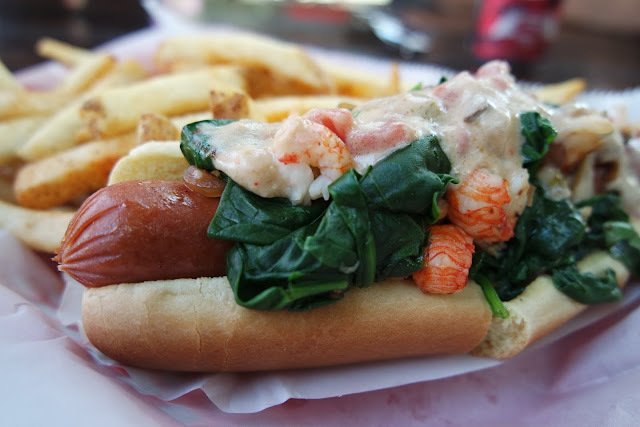 Hannah went for the Lobster Dawg, an all-beef hot dog covered in lobster tails and spinach. She got fries with her dog, and while it made for a pretty shot, she wasn't in love with the seafood-beef combination. 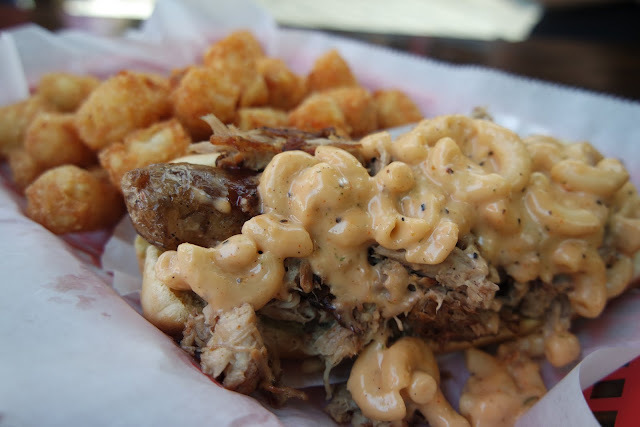 Chuck P got the the Red Dawg, a boudin link topped with pulled pork and barbecue sauce. Of course, Chuck added mac 'n cheese to his dog. He said the boudin was flavorful, but the pulled pork and barbecue sauce lacked flavor. Maybe Frankie's should get on the Jay D's Louisiana Barbecue Sauce train? 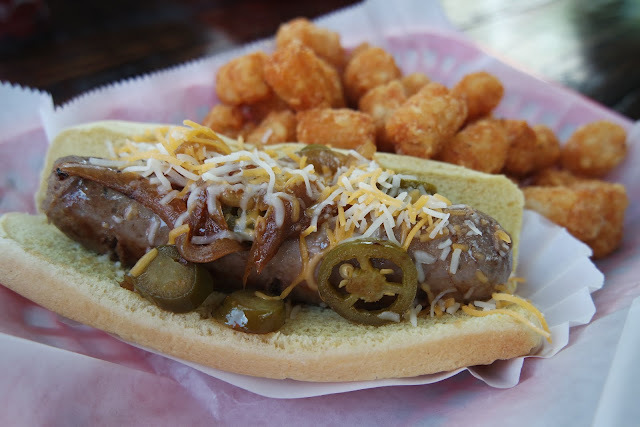 As for me, I opted with the Deer Dawg, deer sausage topped with pickled jalapeño, and I added cheese. At the time I was fighting a killer sinus infection, so I made Chuck taste mine for me. He said it was all heat, no flavor, but I thought it more than edible. We all agreed the quality of buns could have been better, but that the tots were out of this world. I'd definitely eat Frankie's again, but I'm not itching to go back any time soon. Where is your favorite hot dog spot in town? Let us know where we should head next in the comments!